The astounding thing I am experiencing the most as a result of a continually increasing RESPECT LEVEL for myself is the power I feel … the empowering energy and ability to look at my history, to learn from it and to create a new future … and as result, a more internally and externally rewarding life. A higher RESPECT LEVEL for myself compelled me to examine my spiritual beliefs, to let go of what I did not choose or no longer chose to accept … and to study, learn and embrace unconditional love as a new way of life … the unconditional love modelled by Jesus and his many followers, then and now. It has allowed me to see the “logic, practicality and compassion” of the unconditional love God gives us and asks us to give others … as we have been given … which includes respecting/valuing others as we desire to be respected/valued ourselves. A higher RESPECT LEVEL for myself fuels my desire to learn more about myself so I can eliminate thoughts, feelings, habits and conditioning that gets in the way of my growth … and in the way of my developing a mutually unconditional love relationship with a husband. It empowers me to delve into what makes a good marriage that can weather all the storms of life, while giving each person room to grow into their unique potential … without competition or jealousy or any such limiting thought or feeling that seeks to destroy a relationship designed to help us grow through our relationship with each other. In my later years of my second marriage, the first marriage was my attempt to run away from home at age sixteen that ended disastrously within a year, I read Harville Hendrix’s Getting the Love You Want, to do what I could to save my marriage … but it takes two to be committed, to be open and willing to learn and adjust, which he wasn’t at the time, so now, after being single for so long, not wanting to bring the same baggage or new baggage to a final marriage, I’m reading Hendrix’s Keeping the Love You Find so I can not only grow as a partner, but so I change enough to not repeat the past mistakes and to attract a beloved as committed as I am to not just be who we are when we marry, but also to give each other enough room to grow … but without losing the intimate connection a solid marriage needs so we don’t end up going our separate ways because of the increasing distance that results from living two separate lives as my previous husband and I did. A higher RESPECT LEVEL for myself also is enriching my life by providing me with the gift of tolerance and acceptance of all people … allowing me to see and appreciate each person’s unique qualities, difference of opinions, beliefs and experience and to patiently help them appreciate my unique qualities, difference of opinions, beliefs and experience also. A higher RESPECT LEVEL, I’m learning, for others is a natural result of increasing my own RESPECT LEVEL … because we can only give to others what we have inside to give. … And on that note, here is a NEWSFLASH! Soon you will be able to increase your own RESPECT LEVEL to generate the RESPECT “FULL” results you want also. 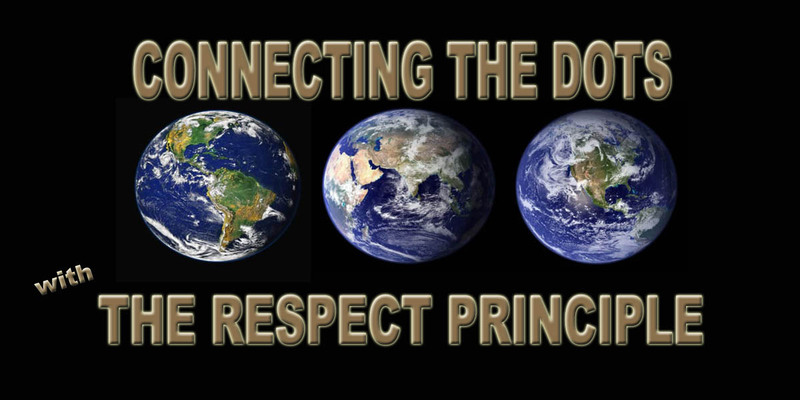 Coming online in the next weeks, not only will you be able to read the final chapters of my fiction book, DARK HORSES, you will also be able to dive into my other book, the non-fiction, Connecting the Dots … with The RESPECT PRINCIPLE as it takes centre stage on the http://www.therespectprinciple.com blog! I so look forward to your repeated returns and comments. Thank you! All Rights Reserved by DARK HORSES PRODUCTIONS/KAITLIN A. TREPANIER, Connecting the Dots … with The RESPECT PRINCIPLE Developer, Author, Speaker, Playwright, Altruistic Entrepreneur, and Human Rights Activist … because every child … every person … should know, by their own experience, they are valued … RESPECTED. Raised a Catholic in a blue-collar community, we did not read The Bible; it was preached to us. When I have tried to read The Bible the past several years because I thought I should at least read one the most influential “works” to better appreciate the mythology and symbolism storytellers draw from, I struggled because the Old Testament is filled with a lot of violence, which stopped me cold. But over time, people like Joel Osteen and Joyce Meyer helped me to try again. Particularly his books and her amplified Bible propelled me to see the beauty of The Bible, transforming me from someone who believed Jesus was born, but not much else … to a student of God through His Word, a believer and a follower. For someone like me who has gone through the experiences I have, in part due to my bad choices because of my low Respect Level that was significantly shaped by my experiences of my childhood community culture, but also because of the oppression someone more different from most people experience, hope has been renewed as has been trust and faith, especially with words such as Joel Osteen’s “Sometimes God will wait on purpose (from lifting one up out of one’s desperate circumstances) not only so you know that it’s His power, but so your doubters, your naysayers, and your unbelieving relatives won’t be able to deny that God has something amazing in your life.” Osteen, Joel, Break Out! Page 133. I know this is true and that people … my family, friends, geographical and web community will see also … because, like I did, they need to believe He is so much more than what many of us have been taught to believe, including wanting to work with us, as He is me, to fulfil the dreams He has put in their hearts too. In the meantime, I’m grateful for all the ways He is meeting my very basic needs while I wait on Him and the miracle He’s waiting to perform at what I believe may be His favorite time of year. Special thanks to you whom He has used to help me through this time; most particularly my brother Phil and his daughter Maxine. Wishing all of you a very special Christmas too this year! I read the book, Getting the Love You Want, by Harville Hendrix several years ago when I was trying to save my marriage of nineteen years, but my husband was not interested in learning, counselling or any such thing, but the universe, God, was interested in turning my life around so into my life came a man who would challenge everything I knew to help me grow. On Oprah’s new Soul Sundays, she ran her interview with Harville from several years ago and what struck me personally last Sunday was Harville’s thoughts about romantic love. It sends us over the top of anything and everything we have known … we are enamoured, often to the point of silliness and high drama (no wonder we love romantic comedies) but then in the other person, our beloved, we ultimately discover triggers and issues related to our childhood wounds that the relationship can help us heal from so we can move forward into healthy mature love, bringing us back together in romance, but this time built on something much stronger (unconditional love) rather than just the thrill of romantic love’s captivating whirl of emotions … or we turn or even run away because we do not understand what love really has to offer us other than the tingly feelings of romantic love. In essence, my fiction novel, DARK HORSES, I realize says the same thing but in its own way. How sweet is that! Especially when combined with the other stories DARK HORSES also shows and tells. Ahhh, this book will make such a great television series! And speaking of which, back to the writing I must go … but before I go, I want to thank you readers for joining the cast of characters and me for the ride! All Rights Reserved by DARK HORSES PRODUCTIONS/KAITLIN A. TREPANIER, <em>Connecting the Dots … with The RESPECT PRINCIPLE Developer, Author, Speaker, Playwright, Altruistic Entrepreneur, and Human Rights Activist … because every child … every person … should know, by their own experience, they are valued … RESPECTED. From a secular view, the dominant philosophy that has shaped humans since the beginning of time is Disrespect. The Disrespect Philosophy is simple. Its premise is that no person or life is valuable until someone says it is … based on what that someone, or a collective of “someones” say what is to be valued … respected. In other words, the Disrespect Philosophy is about control: control that is misunderstood in contrast to true power. Control simply is a lack of trust in and of the world for life to be fair, for resources to be available to all … which all of our fears are driven by … thereby creating a low RESPECT LEVEL that we have been conditioned to use to fill the void of not feeling valued … respected in the Disrespect Philosophy world humanity has been living in for thousands of years … because not enough of us have connected the dots to see what we keep recreating … which, by the way, the Disrespect Philosophy strives to do in order to keep itself and its enforcers in power. The guard and enforcer of the Disrespect Philosophy is bullying: the means used to coerce others into accepting the Disrespect Philosophy without question. How? Simply by the conviction we are taught that no one is valuable unless someone(s) says they are and the qualifiers for being considered valuable are based on the whims of those who have put themselves in positions of power to control. Without high enough RESPECT LEVELS in families, family members are subject to the negative conditioning and the power struggle ensues. Those who take power do so by bullying. Sometimes subtle, often ingenious, sometimes emotional, psychological or physical, bullying comes in all shapes and sizes and affects, because of our lack of awareness of the Disrespect Philosophy, everyone. The Myers Briggs Type Indicator (MBTI) is a personality profiling system presented by Carl Jung and further developed by the Myers – Briggs team. The fundamental basis of the MBTI is there are two primary personality types: Extroverts (E) and Introverts (I). According to the MBTI, Extroverts’ brains require primarily external stimulus for their brains to work at their best, while Introverts brains, on the contrary, often need a fair amount of time to work and be alone because of the constant internal stimulation in their brains they have to contend with. There are two significant challenges the contrasting types brings to our world. One, the world is dominated in sheer numbers by the Extroverts and two, as a result the Extroverts, in a Disrespect Philosophy driven world want the rest of the world to be like them … and as a result, the enforcers … the bullies become conditioned at a very young age. Not that only E’s become bullies, I’s do also, but more from reaction than action. The reason is the Introverts are more driven by their brains to reflect, plus research, study, and analyze differences and as a result tend to be more understanding and often accepting of other people’s differences. Extraverts, on the other hand, will often respond to Introverts’ quietness, reserve and withdrawal as a rejection of them and in our Disrespect Philosophy world take the I’s actions personally … and the battles begin by employing the different methods of bullying: prejudging, teasing, belittling, tormenting, harassing, rejecting, isolating, neglecting, violating, abusing, and killing … spirits as well bodies. Many Introverts, especially those with the dominant function of “Feeling” will often withdraw inward further or may even remove themselves physically to avoid battles with Extroverts which they will seldom win fighting in the Extraverted bullying manner … but, instead will use time and strategies to fight such battles. Without high RESPECT LEVELS, it is a lose lose proposition for both. Extroverted bullies need audiences; Introverted bullies eventually seek quiet revenge … yet since we are driven to be more Extroverted to be in our Disrespect Philosophy driven world, Extroverts and Introverts can act very contrary to their natural, inherent personality type. What happens in our childhood years does not stay in our childhood years … including the bullying (conditional love) we have been shaped by … it follows us no matter where we go … school, community, work, and into all of our relationships. The only way we become free from the Disrespect Philosophy enforcer, bullying, is to recognize it for what it is … something that strives to make us feel less valuable than everyone else so we bully others to make ourselves feel more valuable than others and therefore keep the world spinning out of control by the chaos maker, the Disrespect Philosophy. We are valuable … each and every one of us for the unique gifts, talents and strengths we have to contribute to help make the world, including our personal and private worlds, better places to live … to thrive. This passage from #1 New York Bestselling Author Joel Osteen’s book, Break Out, struck a deep chord within me yesterday as I am “breaking free,” like the DARK HORSE I became after my first attempt almost twenty years ago to become who I really am … a very unique individual with an unconventional personality type, perspective, and a drive for a different life from the “normal” I was born into and lived in most of my life … at great cost to myself and to my family and society … because when we do not live true to our heart, our heart will close its doors to living a life that is a lie because it is not a reflection of who we really are … and ultimately we all lose when we treat ourselves so disrespectfully. Like you, I am not defined by my past, but it has certainly prepared me for my future … the one in my heart I have always known I am meant to be … and the one I am embracing as I move forward into the life my heart tells me I am destined to live. Thank you “past” for my “future.” And thank you Joel Osteen for being the writer and messenger you are too. Strange filing for Employment Insurance after all these years of working poverty wage jobs … but I’m grateful for the opportunity to receive the benefits now that Dad’s special needs care is finally being met in his new, albeit the third, residence in the past year and a half. My writing and communication skills as demonstrated by the writing of both a fiction and a non-fiction book in less than one year, this past one, my public speaking and performance experience, my visual arts, design and communications arts education and experience, my psychology, humanities, philosophy formal and self-directed research and studies, supported by my Business Administration, Honors education and experience, plus all my years of volunteering including roles such as being a JUMP Math Tutor for a grade five student, a side walker and lead for CARD, a facility that uses horses as therapy for people with disabilities … and much more. Time to look up and really move forward, respecting and serving myself, as well as others. In other words, writing, editing, and job searching now fills my days, plus visits to Dad, such as the one my brother, niece and I had late on Wednesday. Dad really is doing so much better, it is kind of hard to believe what he, and all of us, have had to go through this past year and a half. Still, I am glad and grateful I had over the past two years with him, especially since now I don’t know where I’ll be moving to next … but I can go now, knowing I’ve done a good job, he’s in good hands and I’ll be able to help him now in a new way … financially too.